We know about molecules; we know about cells and organelles; but the stuff in between is messy and mysterious… yet that is the level of magnification at which much of the action takes place: the scale of perhaps a few to several hundred nanometres… it is precisely here that our understanding remains the most patchy. In this molecular world of alien-looking shapes and bizarre physics, Human Immunodeficiency Virus (HIV) attacks critical immune system defense cells in human blood to cause the disease AIDS. The AIDS pandemic has taken over 33,000,000 lives and takes millions more each year. Despite technological advances, researchers cannot yet "see" a mature HIV virus in its native environment with atomic detail, but they can assemble known atomic pieces together to construct models of the virus in vivo. Recent developments in our new software autoPack have simplified much of this process and here we present a first-draft model of an HIV particle floating in a cube of human blood serum. This HIV particle measures 0.000000120 meters in diameter which is roughly 1/60 the diameter of the white blood cells that HIV attacks. Blood serum at this scale consists of "salty" water (not shown) filled with blood serum proteins that take up ~6% of the blood serum volume. When you zoom in to a point that you can see individual atoms, the proteins that make your blood serum viscous look like large blobs surrounding the massive HIV particle. You can see that this HIV-in-BloodSerum model is complex, both visually and computationally. We need you to make this model both more clear to scientists and more engaging to non-scientists. We suggest that you convey the fateful nature of humanity's complex relationships with this virus, be they emotional, political, or intellectual, to help us spread interest in the public fight to search for a cure. You must begin by installing the autoPack plugin to load the model into Maya, 3d Studio Max, Cinema4D, or Blender. You should retain some essence of the model, to help us improve the cellPack tool that will help scientists to better understand and investigate interactions that occur in on this messy and mysterious scale of biology. HOWEVER, you may use any tools in your arsenal to convey your message and the contest will be judged on aesthetics and creativity alone and we've provided tutorials to help you customize and modify the models. If you want to retain scientific accuracy, we suggest using molecular plugins like ePMV or mMaya to replace individual molecules with styles to your liking (see tutorials here). If you may prefer to build individual molecules from scratch or to replace them with more fanciful or editorial components, this tutorial will get you started. Again, you are welcome to add, delete, animate, simulate, etc. anything you want in/to the scene to convey your message, create a mood, clarify the data, beautify/horrify the scene, or otherwise accomplish your goals. All participants (individuals, groups, academic or industry) using registered versions of the free plugin autoPack as part of their modeling, rigging, or animating process may participate. autoPack is an open-source general packing algorithm. It packs objects into, onto, and around volumes with zero overlap, zero edge-effects, and complete control ranging from perfect randomness to ordered packing and agent-based interaction. We expect most modelers to find many uses for autoPack. cellPack is a specialized implementation of autoPack that packs molecules together with biologically relevant interactions. We hope many 3D artists will find additional use for cellPack. Click here for more information about autoPack and cellPack. A JPG image or an animation (90 seconds max) linked from YouTube that shows (in full or retains some essence of) the HIV-In-Blood Serum model as loaded through the autoPack Viewer Tab. At least two stages of Work in Progress, which must be uploaded to the challenge pages prior to the deadline. Navigate the asteroid field of the serum proteins en route to the HIV death star. Explore the messy and mysterious realm of Blood Serum and the viral surface in the style of film maker Jacques Cousteau. Sound may be critical to convey emotions in this alien world. Simulate some physics: Our day to day physics may help you tell your editorial story, but you may want to step out of your comfort zone to find inspiration in the bizarre Brownian Dynamics and other physics that occur at this scale from atoms to cells. Contestants will explore a 3D version of this 2D watercolor painting created by David Goodsell that depicts a Human Immunodeficiency Virus (HIV shown here in pink) in a cubic volume of blood serum in molecular detail. This model will be created by scientist-artists Graham Johnson, Ludovic Autin and David Goodsell using the software cellPack (a specialized biological version of autoPackl) developed by Graham Johnson PhD from University of California San Francisco (UCSF) and Scripps together with Ludovic Autin PhD, Mostafa Al-Alusi, David Goodsell PhD, and Michel Sanner PhD in Art Olson PhD's molecular graphics lab at the Scripps Research Institute. 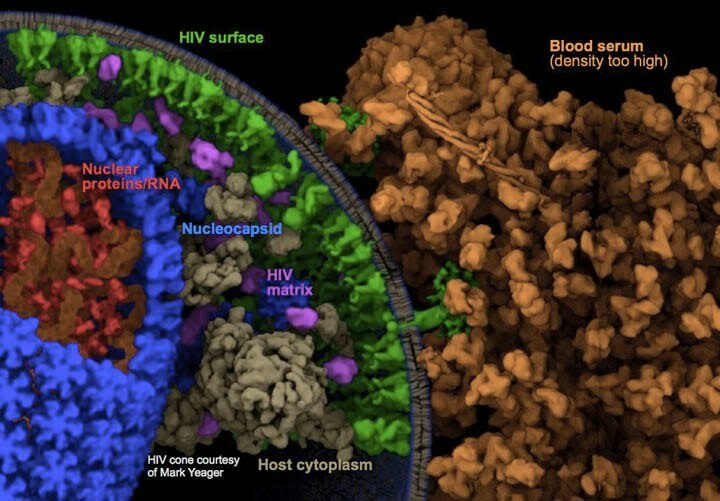 An early version of the autoPack version of this model from 2011 is shown here with the blood serum proteins color-coded orange, the surface proteins of HIV shown in green, HIV cytoplasm shown in purples, human cytoplasm that gets pulled in to the HIV capsid during formation shown in beige, the nuclecapsid proteins shown in blue, and the nuclear proteins and RNA shown in orange. This image, rendered quickly in Cinema4D shows just 1 octant of the HIV viral sphere and a small portion of blood protein, but the final model will contain a full spherical virus with at least 1 viral diameter of blood serum in ever direction to form a cube ~3HIVunits/side. The blood serum proteins (orange) in this outdated cellPack model are 2x more dense than they should/will be in the final, so there is plenty of room to see glimpses of the HIV particle through the blood or to navigate cameras/ships through the blood, etc. We will ultimately provide the most accurate model possible, and we will have scientists working to improve the model as the contest goes on, so contestants can choose to update to the latest and greatest if they have a scene that is rigged, rather than key framed to allow such flexible swapping (they will not be judged on whether or not they update). The final model will have molecular detail that users can choose to modify. autoPack sets up the redundant components of the model (even though it looks complex, there are only ~15 different types of protein in the blood portion of the model and only about ~20 in the HIV portion), so that users can swap out one base reference geometry and have all of the instances update... thus they can use ePMV or mMaya to get different styles of the correct molecules if they want to remain scientifically accurate, or they could replace one protein with a swimming dolphin and another with a spaceship, a tree, a house, etc. This autoPack model is a complex world with limitless possibilities for customization and exploration, but to truly make this contest interesting an to contribute to science and specifically HIV and AIDS research, we think it would be wise to encourage people to all use the same model as a starting point. If a participant chooses to make a high-resolution version of the model by using a combination of the cellPack GUI and a molecular plugin like our lab's ePMV, they can easily get atomic detail into any or all portions of the model (as much as their graphics computer/workstation can handle) in the same vein of the stunning image of HIV by Konstantinov et al. that won 1st place in the National Science Foundation Scientific Visualization Challenge. The major contribution of cellPack to scientific research is that cellPack can generate models as 3D versions of the paintings of David Goodsel, or the HIV model by Konstantinov et al, rapidly and automatically with infinite parameter variations and infinite scaling capabilities in a matter of fractions of a second or many minutes depending on complexity and size. In this image, Johnson ran the same "recipe" that dictates the structures and density of a particular set of proteins that decorate a "synaptic vesicle" (lumpy sphere) to generate 6 different versions of the vesicle with no overlaps of the complex surface proteins in a matter of seconds instead of several weeks that it took to generate the original published model. autoPack can further construct these models into a variety of 3D software packages with the click of a button and with an intuitive GUI. AutoPack itself solves an object packing problem that has plagued 3D modeling and engineering for decades, so contest participants will find other uses for it straight away (e.g. packing objects into a box or people onto a surface with no overlaps–see autoPack website), but we feel that the contest can also help 3D artists contribute to visualization problems (such as "how do we get audiences or researchers themselves to notice any specific critical details when confronted with a modern biological data set on the scale of HIV-in-BloodSerum?"). In this manner, cellPack specifically can help merge art and science to solve scientific problems and to engage otherwise disinterested public audiences, by allowing artists and researchers to work together to contribute their own unique expertise towards a common goal(s).